Kids will do things that are not always logical in an adult's mind, but maybe it is because kids don't rely on logic to do what they do. They just feel like doing something? They do it. That's it. And when I was a kid, I was probably no different. Even to this day, I am still wondering why I did some of the things I did. In elementary grades, we usually were not free to pick any desk we wanted. Maybe at the beginning of the year, we did (I am not even sure) but after a while, the teacher probably had a good idea who should sit where. In this old building, the heating was from those "coil" heaters and obviously those were along the walls. Depending on the orientation of the desks, those would either be in the back of the class or on the side. Since I always loved warmth, I loved it when my desk ended up close to one of those heaters. Do you like the warmth of a blanket, a towel or a sweater coming out of the dryer? 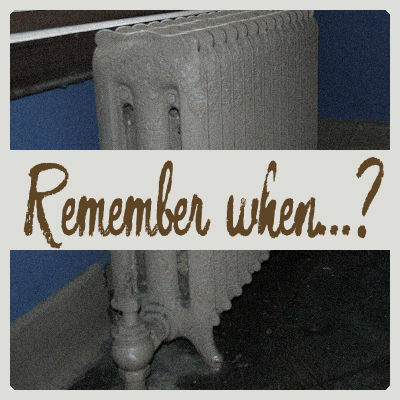 I guess I did to, but in the classroom, it was not about a dryer: we would put our pink erasers on the heater and then, when it was warm, we would pick it up and just enjoy that warmth on our hands, or our cheeks when leaning on the eraser hidden in our hand. This "eraser trick" was so much fun. Maybe it was the warmth, but maybe it was the thrill of doing something the teacher didn't know about. Was it allowed or not? I doubt it was mentioned in any rule! However, one day, instead of putting my eraser (maybe it was getting too small through the school year), I decided to warm my... wax crayon. Although the heaters were never boiling hot, I learned that constant heat can ... melt wax crayons! Yes, i came to class one morning (or maybe it was after lunch) and found out that my crayon had all melted on the heater. It was stuck there, into a melted mess. See how kids CAN learn things in school? This might have been my first advanced science lesson, and I was only in grade 4! Did you ever do something, as a kid, that you really wonder why you did it? anything silly you did in class? Share those fun stories. Don't be shy; we won't tell your old teachers!